Look at that cover! How could I not be all over this?? 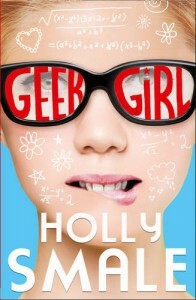 Guys, I was expecting a fun, cute read and that's exactly what Holly Smale gave me with Geek Girl! I just wanted to hug Harriet, she's a sweet girl, if really naive and not fully connected to the world. She did come across a bit younger than her age in the way she acts, but not every 15-year-old is equally mature. I loved that she didn't let everything that happened with a new modeling career change her. She's caught up in the fashion, but she's still her own person and I like that. I love that she learns what it means to be a true friend and how you can unintenionally hurt someone. A lot of the other characters are REALLY quirky and while I had a good laugh over it, I did think that her dad was kinda weird and irresponsible at times and he was actually the only one who annoyed me because of his antics. Harriet's stalker Toby was adorable in his cluelessness and I absolutely LOVED the agent who spotted Harriet, who is so out there and has all these crazy pet names for Harriet, is was FANTASTIC! Seriously. And though we don't really get to see a lot of him, I really liked Nick as well. Reading this book felt like a YA version of America's Next Top Model (only set in England and all) and I am addicted to that show, so of course I enjoyed this book! I love to read about the crazy of the fashion industry and this book made me laugh out loud several times! It was a lovely debut and I just saw there'll be a sequel, YAY!